It’s high time that I send some love to the Portobello mushroom. 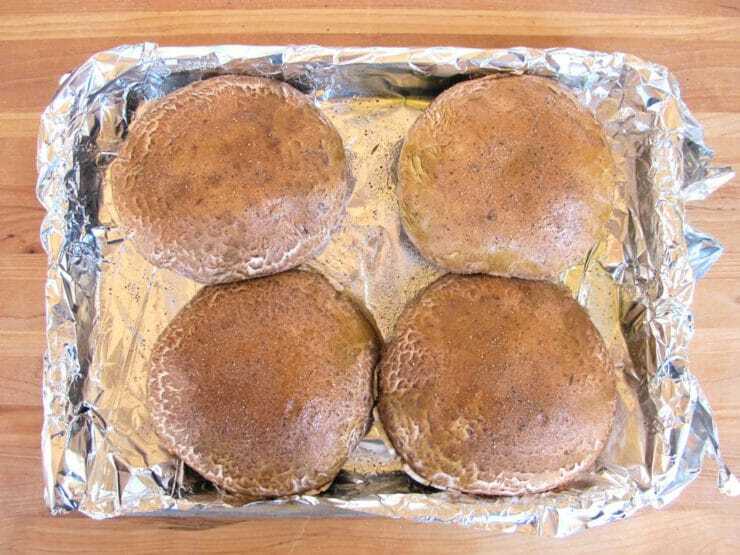 Many vegetarians use Portobellos as a natural alternative to meat– for example, to replace the beef on a hamburger. The Portobello’s meaty taste and texture come from exposed gills beneath the large mushroom cap, which can measure up to 6 inches in diameter. As air moves through the gills, moisture evaporates, resulting in a rich and hearty mushroom you can really sink your teeth into. Truth is, Portobello mushrooms are a large, fully grown relative of the crimini mushroom, those small brownish-white mushrooms you buy in cellophane-wrapped boxes at the grocery store. During the 1980’s, mature crimini mushrooms were given the “fancier” name of Portobello, resulting in increased consumer interest. Portobellos quickly became one of the most popular mushrooms on the market, prized for their size and meaty flavor. You may be surprised to learn that one Portobello mushroom contains more potassium than a banana, as well as some powerful antioxidants… which means they’re really good for you, too! In my home we eat vegetarian most of the time, and Portobellos have become a regular part of our meal rotation. I love roasting them with salt, pepper, and a bit of olive oil. They don’t need marination or added spices; a simple roast in the oven is enough to bring out a ton of flavor. 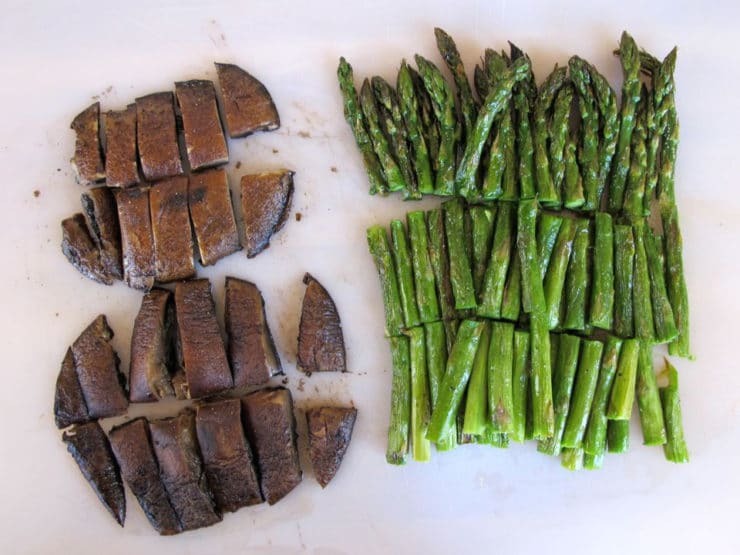 A couple of weeks ago, I roasted some Portobellos along with a bunch of fresh asparagus, which is just coming into season here in California. The natural sweet and savory flavors of both vegetables fully emerged after roasting. Combining the two roasted vegetables proved to be a magical flavor combination. I whipped up a warm, creamy goat cheese sauce to pour on top (the sauce isn’t overly “goaty” thanks to the added milk and cayenne). 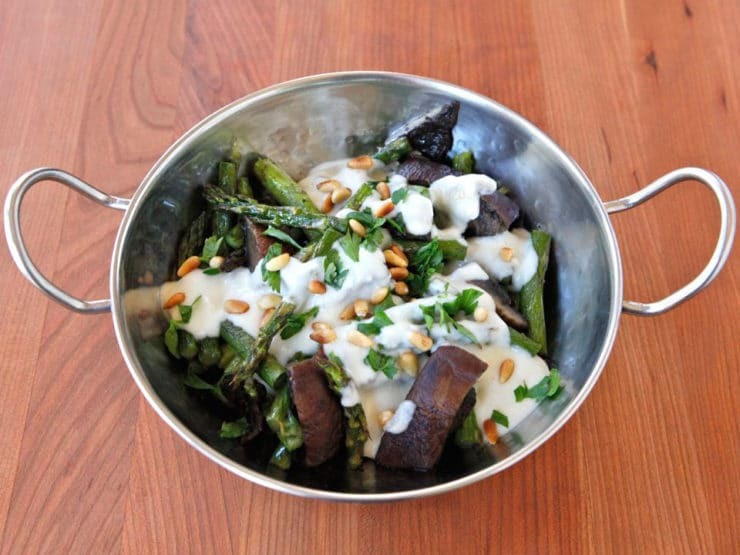 A sprinkle of toasted pine nuts and flat leaf parsley on top completes the dish. It’s hard to find words to describe how much I love this healthy, low carb vegetarian entree. It combines some of my favorite flavors into one tantalizing dish. You won’t miss the meat. Enjoy! 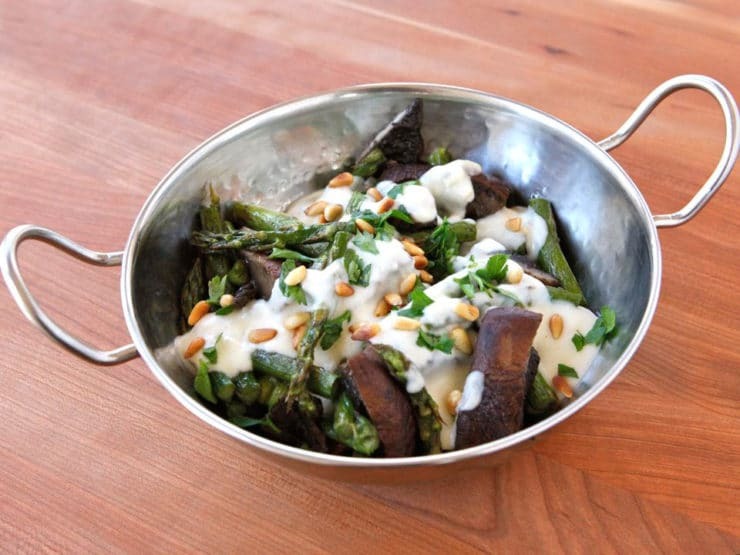 Roasted Portobellos & Asparagus with Goat Cheese Sauce, a simple vegetarian entree or side dish recipe. 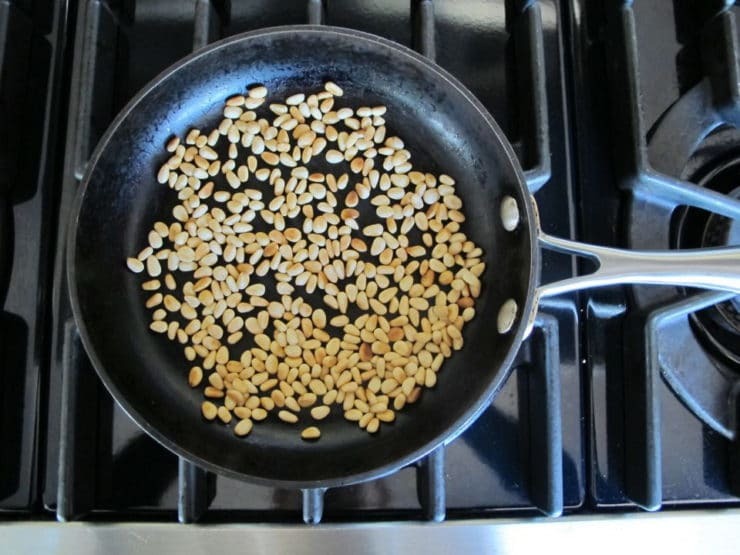 Preheat oven to 425 degrees F. Toast the pine nuts in a skillet over medium heat for a few minutes, stirring continuously, till they turn golden brown and aromatic. Trim off the tough, thick end of each asparagus stalk. Line a baking sheet with aluminum foil for easier cleanup, if desired. 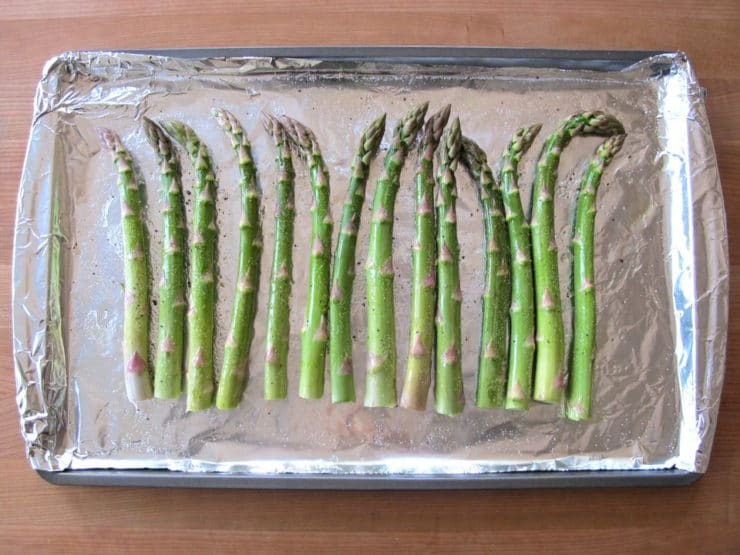 Spread asparagus out on ungreased baking sheet. Drizzle extra virgin olive oil evenly over the top of the asparagus; I use about 1 tbsp of oil for each pound of asparagus. Use your fingers to gently rub each stalk evenly with the olive oil. Sprinkle the asparagus with salt and pepper. Line another baking sheet with foil. Remove the stems from the portobello caps. Rub the tops and bottoms of the caps with 1/2 tbsp of olive oil per cap. Sprinkle the caps with salt and pepper. Place the baking sheets in the oven. Roast the mushrooms and asparagus for about 15 minutes till the vegetables are tender and cooked through. The asparagus may cook faster than the mushroom caps depending on how thick they are. While vegetables are roasting, make the sauce. 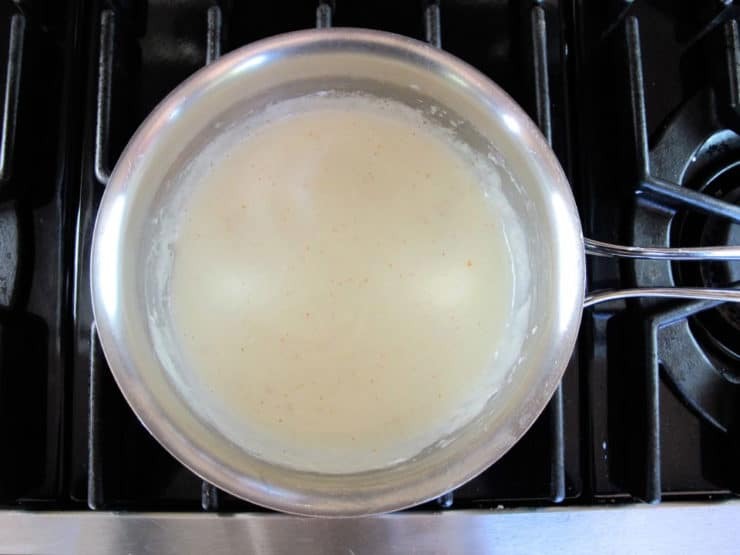 In a small saucepan, melt butter over medium heat. 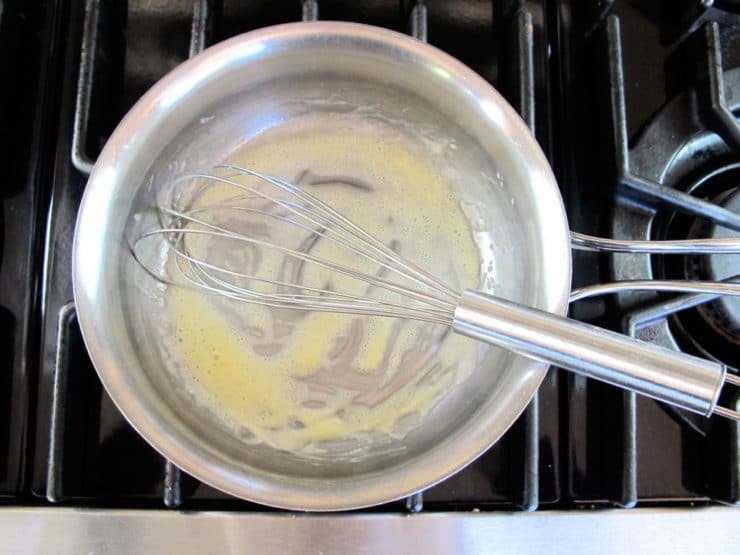 Whisk in the cornstarch or potato starch till a buttery paste forms. 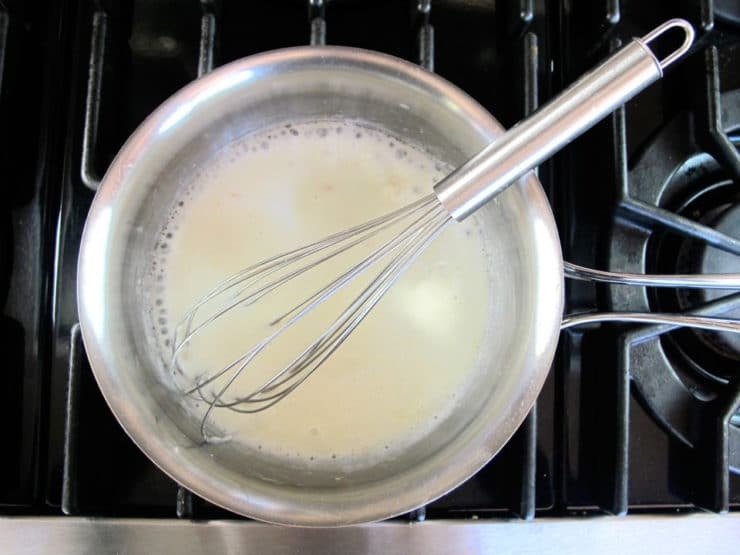 Whisk in the milk and garlic, stirring constantly, till the milk gets hot and begins to thicken and bubble around the edges. Whisk in the goat cheese and cayenne till the goat cheese is melted and the sauce is creamy. Season with salt to taste (I use about 1/4 tsp). Turn the sauce to low and keep it warm till ready to serve. When the vegetables are cooked, remove them from the oven. Drain off any excess liquid from the mushrooms. Slice the mushroom caps into 10-12 slices each. Slice the asparagus spears into 3 pieces each. Place the warm vegetables in a bowl and toss to combine. Whisk the sauce again, breaking apart any thin skin that has formed on top. Pour the warm sauce over the vegetables. Sprinkle with toasted pine nuts and chopped parsley. Serve warm. The sauce will only look "pretty" for a few minutes, so sauce the dish just before serving. Over time the sauce will thin out over the warm vegetables, and will look less opaque-- but don't worry. Though it won't look as pretty, it will still taste amazing. Thank you. That’s a perfect meal… right up my alley. I haven’t got the sprigs or the mushrooms but I’ve just bought a whole bunch of goats cheese to make a large batch of sauce to freeze in small portions. I’ll use your sauce recipe, thanks! I made this recipe substituting brussels sprouts for asparagus (out of season) and it was delicious! Great idea for a sub Emily! 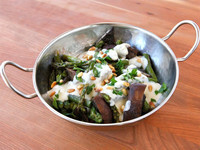 This is a great recipe and guests really liked the green bean and pepper salad as well . I substituted the sauce you gave for the roasted cauliflower dish for the goat cheese sauce in this recipe, which works for vegans, although I am no vegan, I do have friends who are. When does your cookbook come out? Any ideas for a substitute for goat cheese? I’m not sure I can easily find it in my market, although truthfully, I’ve never looked for it! Hi Alice! Pretty much every grocery store should have goat cheese in the cheese section– it’s soft and usually comes in a short log-shaped package. If you can’t find it, substitute a creamy feta (block feta rather than dry crumbles), or whole milk ricotta cheese. If using feta, salt carefully, as the feta naturally has a lot of salt. Enjoy!